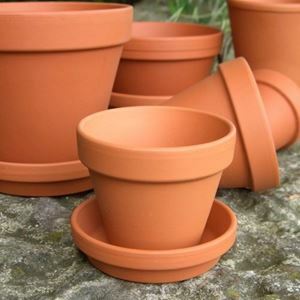 We offer a range of traditional style terracotta flower pots, half pots and long tom pots with matching saucers for a multitude of uses around the home & garden. These pots all have a drainage hole in their base. This range of flower pots is made in Germany. 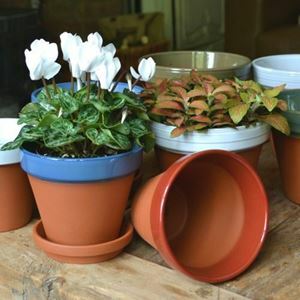 The flower pots are also available with coloured glazed rims. These are glazed by us at our pottery in Nottinghamshire. 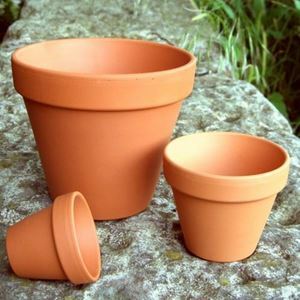 Flowerpots are not just for gardens & planting but also have multi-uses from painted craft pots to baking bread. 13.2cm diameter x 11.7cm high (approx 5¼in x 4½in) - Pack of 10. 8cm diameter x 7cm high (approx 3¼in x 2¾in) - Pack of 10. 5.7cm diameter x 5cm high (approx 2¼in x 2in) - Pack of 25. 13.2cm diameter x 11.7cm high (approx 5¼in x 4½in). - Pack of 10. 8cm diameter x 7cm high (approx 3¼' x 2¾') - Pack of 10.